What happens when Adam Sandler stops squealing like a surprised pig in every scene? 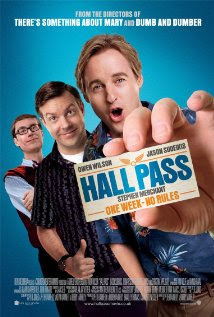 You get a comedy movie that is actually watchable in Just Go with It. While the screenplay is as predictable as they come, there is a certain simplicity to it that actually makes it fun. And with an adorable cast, this is a surprisingly heartfelt and funny chick-flick. Danny (Adam Sandler) is a smart-mouth serial-womanizing plastic surgeon, who uses a made-up story about a horrible wife to make his move on women. His assistant is the stunningly hot, yet under-appreciated Katherine (Jennifer Aniston), who is a single mother with two adorable kids - Maggie (Bailee Madison) and Michael (Griffin Gluck). When Danny meets a stunningly hot dumb blonde Palmer (Brooklyn Decker), and gets caught up in the story about his imaginary family, he has to look to Katherine and her kids to stand in. The plot is as expected. The hot chicks are curiously hidden in plain view till they buy expensive clothes and high heels. Guys can be all the pigs they want, till they meet the hidden hottie and suddenly become amenable to settling down. And the kids are all grown up till there is a game night, and they suddenly break down yearning for a missing parent. The kids perhaps are one of the best aspects of the movie. Between them faking a British and mafia accents, the two are hilarious. Between them they manage to carry most of the scenes with aplomb. And where the kids are absent, a quiet(er) Sandler cracks a few funny ones himself. Aniston is just herself; and by that I mean Rachel from Friends. The rest of the cast pitch in with their own brand of crazy that includes German accents and gay husbands. Sandler comedies started going downhill right after he realized he was funny. Somewhere after Click, I decided not to watch a Sandler movie again. This movie however, was a surprising and welcome change. Not only was it funny, it added a few memes to pop culture - like "making a Devlin". And when you have to do something like that, listen to the advice from the movie - and just go with it. There is fate, and then there is luck. But what if that wasn't always so, and luck was something you could use to change what can be. What if you could choose to deploy your luck to make the finger of chance point your way. Intacto takes that idea and runs with it. 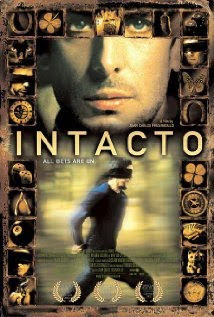 Inhabiting a world populated by a cast of mysterious characters, uniquely seedy games and obsessive cops, Intacto is an bewitching look at a life of pure luck and chance. The premise of the movie is unique. Everyone has a certain amount of luck, some more than others. The luckiest are those who tend to take the luck of others around them - like the lone survivors of plane crashes for example. Some are inherently lucky while others have the ability to steal luck from those around them. And when you pit these supremely lucky people against each other in games of pure chance you get you find out the most fortunate of them all. For over 30 years it has been Samuel (Max von Sydow), a secretive old man who lives under a casino and has never been beaten in a game of chance. Samuel had an apprentice, Federico (Eusebio Poncela), who had lived in the same casino, and made his mark stealing the luck of patrons who were beating the odds of the house. When Federico decides to move on, Samuel, affronted, reacts by emptying the former of all his luck. Stripped of his strength and turned into a pariah, Federico begins to search for a challenger. Someone who can help him beat the old man in a game of chance, and redeem his humiliation. He gets his chance, when he meets the lone survivor of a horrific plane crash - Tomás (Leonardo Sbaraglia). Unfortunately, Tomás is a bank robber who is being relentlessly pursued by a cop Sara (Mónica López). Chance and destiny come together in an explosive ending that is no more certain than a roll of dice. The movie has a curious style. The scenes are heavy and oppressive. Dialog is limited, which is a good thing because with all the depth brought out by the atmosphere of the movie, anything said could only sound trite. Screenplay is choppy, in a disconcerting deliberate way. Most scenes are not set up, but unfold for the characters as they do for the audience. There is a certain machismo to the games of chance, that borders on the excessive. The storyline, beyond the premise, is not entirely plausible. The net result is that the movie tends to gravitate towards being more of a graphic novel. Which is not particularly a bad thing. Equally interesting are the games people play. They include running blindfolded across a highway, dousing the head of contestants in molasses and seeing if a bug chooses one over the others and the ultimate - firing a loaded gun with five bullets in six chambers at an opponent's head. This is a truly original movie. It might not be the most well adapted, or the most brilliantly made. But it has a certain charisma to it. Like a craggy old man with piercing blue eyes, it is oddly disconcerting and keeps you intrigued. There are moments of brilliance, and moments of silliness. But as luck would have it, it all works out to be deeply engrossing. 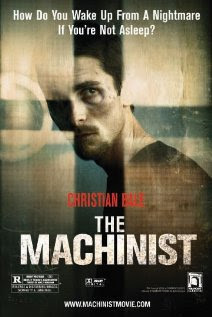 Talk of Christian Bale movies led to a re-watch of The Machinist. Even for a second viewing, the movie was just as intense and gripping as I had remembered it. Over the years, psychological thrillers have become relatively commonplace, bringing with them a plethora of novel mental diseases into public limelight. Yet, there is something about the power of something as commonplace as guilt, that can take an unbelievable toll on the human mind. And when it is accompanied by a harrowingly gaunt 120 pound Bale, there is something tantalizingly concrete about the experience, that sticks with you. Through the movie and beyond. If you have not heard of the movie yet, you probably may not know that Bale starved himself for the role. Allegedly, consuming one cup of coffee and an apple each day, he lost 62 lb, dropping to a mere 120 lb. This leaves him, for most part of the movie, as little more than a skeleton. Sunken cheeks, ribs sticking out, eyes unnaturally protruding, barely covered by the stretched eyelids, Bale presents an image of insomnia that is hard to imagine let alone replicate. The most incredible part is that he had to regain the mass plus 60 more pounds for his role in Batman Begins. Trevor Reznik, hadn't slept is more than a year. He works in a factory as a machinist, handling precision cutting tools. Through the year, he not only loses weight, but finds himself increasingly isolated from everyone else around him. His only two companions are a waitress at an all-night airline diner, Marie (Aitana Sánchez-Gijón) and a prostitute named Stevie (Jennifer Jason Leigh). Things take a turn for the worse, when he meets a new coworker named Ivan (John Sharian). Ivan is a guy Trevor has never seen before, but it seems as if none of the others that work with him know him either. Figuring out who Ivan is becomes an ever present distraction for Trevor, and in one such distracted state he accidentally causes one of his coworkers to lose a hand. Uncovering Ivan's identity now becomes an obsession for Trevor that nothing else, not even losing his job and his sanity, is able to stop. Already on the edge, Trevor's reality begins to crumble, scene by scene in front of the camera. This is probably one of the most compelling portrayals of psychotic self-destruction in movies. As goes Trevor, so does the audience, till the final unraveling of the mystery along with the last shred of reality. There is more to the movie beyond the haggard Bale. The story is well done, the screenplay and editing are the right level of uncomfortable. Lighting is harsh, accentuating the bone-structure of the lead insomniac. The whole movie sports a flat, desaturated look, through which patches of color seems to burst forth as if in a dream. There are so many other details that add additional dimensions to the movie. Like upon finding an unexplained post-it note on his refrigerator, Trevor proceeds to begin analyzing it, ignoring the apparent bucket-full of blood that seems to be dripping all around it. These and other dissonances between Trevor and the audience work to enhance the feeling of disconnection with reality. The Machinist is not a scary psychological thriller. It is introspective thriller, riveted on a character that seems larger than life and pitiful at the same time. It is a private study of reality, at the center of which is Trevor. By the end of the movie, the abnormal begins to feel so normal, that it takes a while and conscious effort to reset the baseline for reality. And that is when you will be most thankful for a good night's sleep, and a fresh start the next day. Remember the movie 50 First Dates? Source Code is nothing like it. Apologies for any unpleasant memories that reference may have brought about. Instead, Source code is an intelligent story about having more than one chance to get it right. It is a story about the dignity of human life, and an indulgence of the hope of a better life elsewhere. Capt Colter Stevens (Jake Gyllenhaal) is a former helicopter operator for the US forces in Afghanistan. As a result of injuries suffered during a mission, he is severely incapacitated, to the point of death. He is however kept alive, as the unwitting pawn in a top secret military program. Through his brain which is on the throes of death, the program, known as Source Code, is able to tap the last 8 minutes of other people that had been recently killed. Source Code works by inserting Stevens into the body of a suitable candidate, and through him re-live a phantom version of their last 8 minutes. Stevens could interact with people around him and bring back that knowledge with him, as many times as required. The mechanics of the movie, while vital to the story's existence do not play that much of a part in the plot itself. Stevens does stray from the path proscribed by his controller, but the motivation isn't as much to test the capabilities of the mechanics, but it is more to save the people on the train and particularly the girl he just met, who seems to know him so well. As a result, the story starts off at a disadvantage - there is always only one way for the story to end. Curiously the relentless unveiling of the truth feels more satisfying than it should, almost like destiny fulfilled. Technically the movie is subtle. The explosions are understated and always in the background. Editing is mature and purposeful. And while the Q-word is used, one could safely ignore most of its' ramifications with no impact to the story. The dense explanatory dialogue takes care of that. 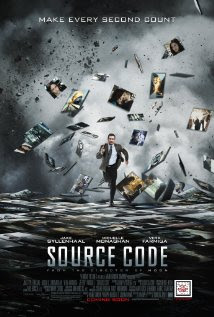 Overall Source Code is a tightly woven tale, a star in the new pantheon of accessible main-stream Science Fiction fare. It almost feels like a new era, one reminiscent of that of Star Wars. While the Source Code is no Star Wars, it is one where you get to meet the characters, sympathize and identify with them, and more important invest in their well being. Once you do that, it does not matter if it is the same eight minutes over and over again. You will be right there, cheering them on, hoping that something more complete is just round the corner. 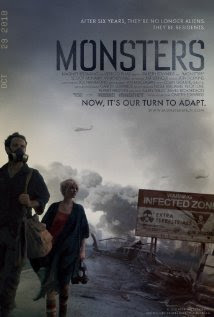 As a movie title, Monsters is highly misleading. As a story, it could almost have passed for a chick flick. But as an overall movie package, it was understated in conception, gritty in evolution and excellent in execution. Six years ago, NASA, the poster-child of extra terrestrial boo-boos, sent a probe to collect samples of potential life in the Solar System. Upon re-entry into Earth's atmosphere, the probe crashed, presumably spilling it's contents into the dense jungles of Central America. Whatever was in the probe, rapidly evolved into large tentacled aliens that infected the region between the US and Mexico. The entire area is now cordoned off and the populace on either side of the infected zone is slowly coming to terms with living in an alien-infested world. And these aliens, by the way, are the large octopus-like namesake monsters. Andrew Kaulder (Scoot McNairy) is a photo journalist in uninfected Mexico, who is unsuccessfully looking for a story within the biggest event in Earth's history. As luck would have it, the daughter of the owner of his publication, Samantha Wynden (Whitney Able), is injured in a recent Monster attack. As a result he is commandeered to check on her and make sure she is on her way back to the US. On their way back, they miss the last ferry for the next six months out of Mexico, and decide to instead take the land route back to the country. And this route, unsurprisingly, passes through the quarantined area. As they bribe their way into a passage back to America in this new twist on fence jumping, the two encounter the infection, terror, attacks and beauty. During the process, they also discover each other. The movie is luxuriously slow in progressing the story, but rarely feels cumbersome. It is no adventure quest movie, but instead it is trained squarely on the humans finding their footing in the new world. Shot entirely through hand-held camera, the movie has a very strong documentary feel to it, but thankfully eschews ugly fast-paced shaking for more refined movements. Some of the scenes around the enterprise that has sprung up against the background of suffering is well portrayed, forming the intellectual bulwark for the story. Music naturally forms a big part of both the narrative and the backdrop, successfully building the base to create an absorbing if not tense feel to the movie. Alien and Science Fiction are evolving past the combative alien narrative and the apocalyptic destruction movies into the more mundane coexistence narratives. District 9 was a great example, and Monsters is a worthy inclusion into that list. The key to this movie is expectations; keep them low. For it isn't much of a genre movie as it is a well put together tale, in a world that could realistically come true.